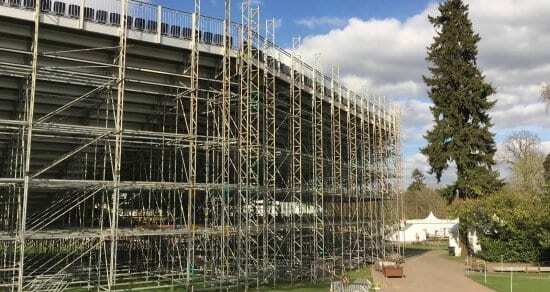 We combine technical scaffolding engineering with a creative approach to deliver any event scaffolding brief. We construct sub-structures for temporary buildings, seating grandstands and broadcast structure supports. Whether you’re looking for a temporary grandstand as part of a stadia rebuild or a permanent structure, we have the expertise, products and a superb track record of working with professional sports clubs. We can design and install grandstands that include toilets, bars and retail units while offering great sight lines for spectators and conforming to all relevant safety regulations. Using steel, solid under crofts we can create grandstands that not only fit in with your stadia but can remain in place for as long as you need them without compromising the spectator experience. Our scaffold media camera platforms and towers provide you with robust, stable broadcast positions with optimum vantage points for photography and filming. We liaise closely with event organisers and broadcasters to ensure your media camera platforms are ideally suited to the broadcaster’s requirements, while still fitting the overall aesthetic feel of the event. Our project managers will accompany you on advance site visits with broadcasters to assess the potential positioning of your camera platforms and owners to give the best possible broadcast without intruding on the performers / sporting competitors, while minimising intrusion on spectator space. These broadcast facilities can be clad to blend in or carry sponsors branding. We provide effective LED screen supports to ensure that these valuable assets are kept secure, using bespoke installations to make sure equipment can blend into the event environment while still offering the highest structural integrity. We will supply you with effective and reliable screen support solutions which are engineered to carry event the heaviest screens. We’ll also provide detailed calculations for wind loading or move screen tracks. Arena can provide scoreboards for a wide range of sporting events. Whether it is a large single structure or simpler remote scoreboard, we will ensure your event has the best solution from our extensive range. We supply and build strong, load bearing event substructures to ensure the foundations of your event are reliable, sturdy and safe. Our use of ground levelling platforms and extensive scaffolding range means we can meet any client brief. Arena have decades of experience building complex event structures such as grandstands, temporary buildings, ice rinks, gantries, lighting columns and bespoke event structures. Our superb health and safety record, design and engineering staff and logistical expertise all combine to make us reliable, flexible event structure construction experts with a track record of working at some of the most high-profile events in the world. We supply live broadcast studios and commentary box structures which are ideally suited for use at high-profile sporting and corporate events. We design these structures with practicality of use in mind and the awareness that they need to integrate seamlessly with your other surrounding overlay products. We have a range of scaffolding to suit different occasions. Our skilled team has worked in have global event experience and can adapt to any venue terrain, size and scale. 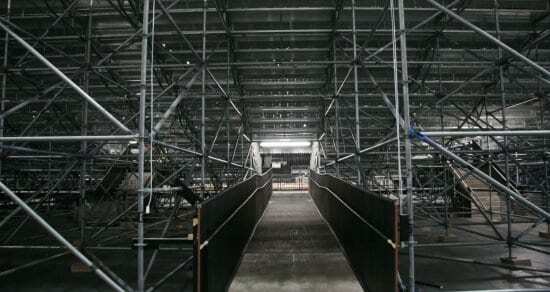 Our event scaffolding systems include the traditional HAKI method aswell as Cuplock and PERI. We continue to invest in new equipment and are now also using the Plettac Metrix system. With any brief we look at which system is the most suitable for your event and venue. For those special aerial camera shots or just to run cables over a site without inconveniencing the audience we can supply and install event gantries to complete your infrastructure. We can construct gantries to carry service cables around or over obstacles such as roads, walkways and structures. If you need gantries for event branding, screens or event start and finish lines and signage we can also provide those. While events scaffolding and structures are vital, you don’t always want them to be seen and we have the events cladding and finishes t make your event as attractive as possible. Whether you are a global brand looking to use every available space to get your message across or just want a modern finish, we have the products and expertise to ensure a great look. We use a range of coloured netting for events brand advertising and can also use timber products for a more contemporary appearance. We supply and construct assisted viewing platforms so that your event is accessible to all audience members. These are constructed with excellent sight lines in mind. We have worked on events such as The Olympic Games and other major sporting events where these platforms were needed. Our viewing platforms can also be used for media facilities and VIP areas. For entry and exit points, internal access and disabled ramps we have a great deal of experience in factoring these into any event structure. We have built event staircases fora variety of events including The Cheltenham Festival, Ryder Cup and The Olympics. We can provide internal access staircases for camera platforms, ramps for disabled access to grandstands and viewing areas and attractive entrances. Easy to use exit points for larger crowds can also be designed and installed. Whatever the look of your event, we can ensure any staircases, platforms and ramps fit into the overall style. Liaising closely with clients and event organisers we carry out our work with clear vantage points, filming capabilities and structural integrity at the forefront. We work at high-profile sporting and corporate events, finishing our structures with pristine interiors.